When it comes to saving energy, it’s easy to get so focused on how far we need to go to meet our targets and goals that we forget to take a look back to see how far we’ve come. Case in point – this past April, UHN set new, aggressive energy saving targets, replacing our original, aggressive energy saving targets that we hadn’t fully met. And I was so intent in figuring out how well we were doing against our new targets that it wasn’t until last month that I realized that, albeit 6 months later than we’d planned..
We’re meeting our original energy consumption saving target! This is something all at UHN should celebrate – it truly is a team effort in every sense of the word. So, before we return to new targets and projects, take the time to pat yourself on the back and reflect for a moment, not on where we’re going, but how far we’ve come…we’ve done something good! 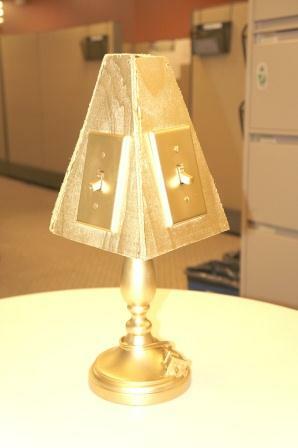 UHN’s Golden Lightswitch Award for energy excellence. This entry was posted in Beyond Talkin' Trash, Energy Stories (powerful stuff) and tagged energy behaviour change, energy conservation, operation tlc. Bookmark the permalink.